There is not a great deal to see at this site. 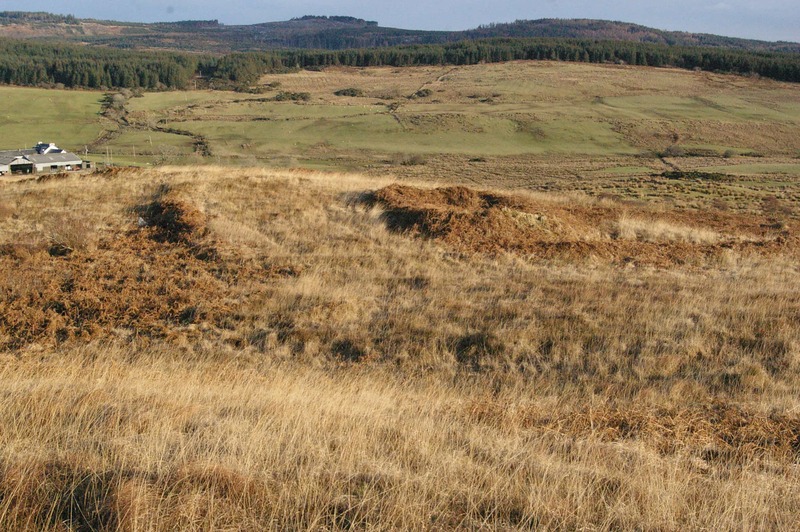 Traditionally held by local people to have been a chapel, there are the turf-covered footings of a rectangular building within an irregular enclosure. The turf-covered foundations of the Stillaig chapel and the enclosure wall. 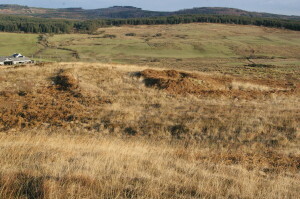 The site is often bracken-covered, obscuring what little remains to be seen. It would benefit from a little clearing out. And it is a site that is begging for a little archaeological investigation too. In spite of the modesty of the site, it is well worth a visit, being less than 2 km from Portavadie. While you are here, why not also have a look at the neolithic cairn at NR932675 and the standing stone at NR931683. Or follow the farm track south to Eilean Aoidhe for a picnic with a lovely sea view. The place-name Eilean Aoidhe contains Gaelic eilean ‘island’ (for it is nearly an island) and an echo of the Old Norse word eið ‘isthmus, narrow neck of land’, which accurately describes the little strip of land, with beaches on either side, that you will walk over to get onto the ‘island’. Eilean Aoidhe and its narow neck of land (Map: OS data © Crown copyright [and database right] 2015). If you are staying in Portavadie ornearby there are some lovely walks around here. GETTING HERE: For an Ordnance Survey Map of Stillaig and the surrounding area, including roads and footpaths, click on ‘View Larger Map’ below. Come out of Portavadie on the road, and at Pollphail village (NR932691) leave the road and walk cross-country, going SE. The chapel site is on the rising ground just west of the farm track that runs south down to Salann Bay. Take the road south-east out of Portavadie, stay on it going through Pollphail, then after 1 km turn right (at NR942690) down the farm-track towards Salann Bay, following the track for about 580m. Hop off and climb up the hill on the right side of the road.